2017 will be the hottest year on record since global temperature measurements began, that was not affected by El Niño, a naturally occurring phenomenon. 197 countries party to UNFCCC (United Nations Framework Convention on Climate Change) gathered in Bonn, Germany during the past two weeks to chart the future of global climate change policy. The focus was on 170-party strong Paris Agreement (including war-torn Syria which ratified the agreement), a breakthrough deal reached in 2015 to limit the global temperature rise well-below 2oC and if possible constrain it at 1,5oC, a threshold seen as the tipping point for many vital ecosystems and livelihoods around the world. These livelihoods include Fiji, the highly vulnerable Pacific island nation that serves as the president of this year’s climate summit, better known for its acronym COP23 (23rd Conference of the Parties). As UN Secretary-General, Antonio Guterres also commented in his opening speech, Global Carbon Project 2017 observed that after 3 years of emissions plateau, global greenhouse gas emissions mainly from fossil fuels (40% from coal emissions alone) are on the rise again. This simply is incompatible with any climate-stable future for humanity and for rest of the planet. Moreover, there is no time to delay bold action since the most severe climate impacts including centennial droughts, devastating storm surges and increasing weather extremes are already here with us. COP23 will best be remembered by the public shaming of Trump administration, which intends to pull USA out of the Paris Agreement. Trump’s announcement to withdraw funds from Intergovernmental Panel on Climate Change, the largest scientific body of its type received immediate response from French president Macron and German chancellor Merkel, who pledged to make up for any funding revocations from the US. However COP23 also marked a new stage towards consolidating global policy efforts before the Paris Agreement formally enters into force in 2020. For example, the emergence of a 20 country-strong Powering Past Coal Alliance responsible for 2,4% of global coal consumption during COP23 hints only at a beginning of a larger wave of changes in the global political economy. Turkey will not be immune to this sea of changes. 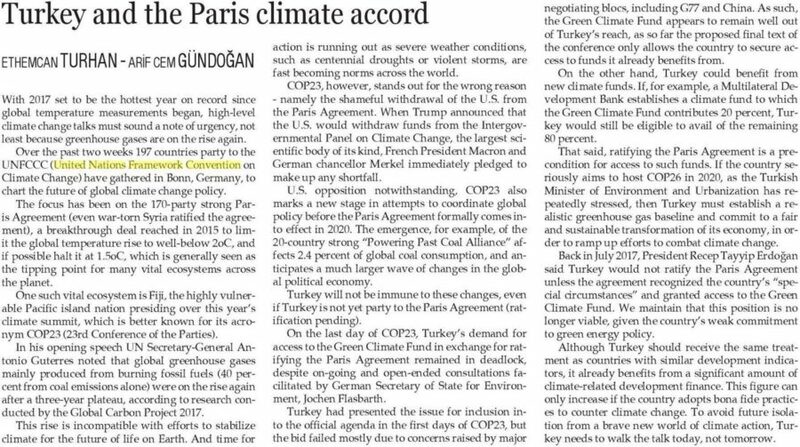 However, Turkey is not a party to Paris Agreement yet, pending ratification. 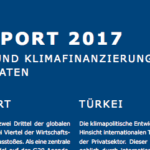 At the last day of COP23 in Bonn, the deadlock regarding Turkey’s demand for access to Green Climate Fund as a condition of its ratification of Paris Agreement was still there despite the ongoing open-ended consultations facilitated by the German Secretary of State for Environment, Jochen Flasbarth. 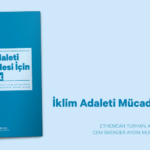 During the first days COP23, Turkey presented this issue to be adopted in the official agenda, which failed by and large due to concerns of major negotiation blocs including G77 and China on Turkey’s position. 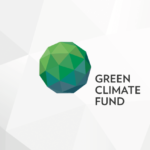 It appears that Turkey is still far from accessing to the Green Climate Fund as the proposed text only allows the country to secure access to existing funding resources from which it already benefits. 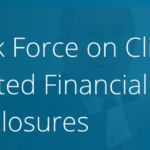 On the other hand, there are other means available to Turkey to benefit from new climate finance resources. 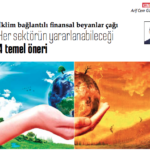 For instance, if a Multilateral Development Bank establishes a climate finance facility of 1 billion USD where it gets 20% of this amount from the Green Climate Fund, Turkey will still be eligible to benefit from 80% of this facility. 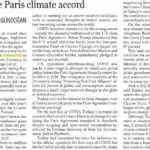 Nonetheless, in order for Turkey to access these funds and enable its pro-active role in the global climate regime, ratifying Paris Agreement and rethinking its position is a pre-condition. 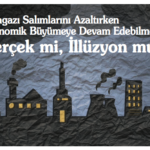 If the country is to host COP26 in 2020 as repeatedly voiced by the Minister of Environment and Urbanization himself, Turkey needs to significantly alter its course by establishing a realistic greenhouse gas baseline and committing to a fair, sustainable and just transformation of its economy. 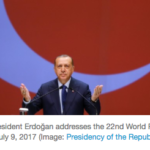 Back in July 2017, President Erdoğan underlined that Turkey is not willing to ratify the Paris Agreement unless the country’s “special circumstances” are recognized in the framework of Paris Agreement, and unless Turkey is granted access to climate finance under Green Climate Fund. We maintain that this position is no longer viable given the country’s weak level of ambition and precedence of energy policy over environment. 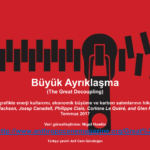 Although it is clear that Turkey needs to be treated on par with countries with similar development indicators, it already benefits from a significant amount of climate-related development finance and will increasingly do so once it revisits its position in line with the best available science. If Turkey does not want to isolate itself from the brave new world of climate action, it needs to walk the talk today, not tomorrow.